Guidelines for filling up the TS Teachers Online Application form and Web Options by Head master / Teachers: Welcome to all the Headmasters and Teachers to the online, web based transfer counselling system. This is designed to facilitate an easy, transparent, objective way of identifying vacancies, filing transfer application and making options/choices one is interested in. The Centre for Good Governance (CGG) is providing al technical support to facilitate the online application submission and web options exercising and drawing up of seniority lists and transfer lists. 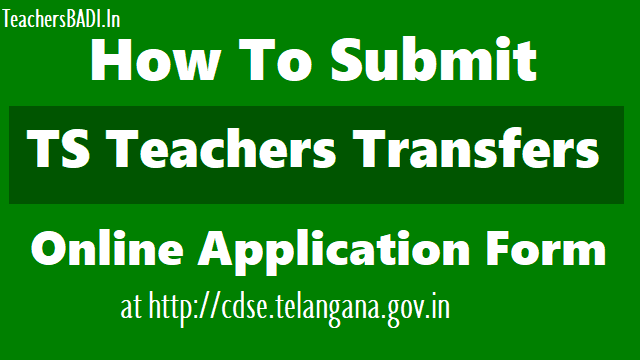 Online Transfer Application Form Submission, Teachers Transfers Application Process, How to submit Teachers Transfers Application Form..
How to print the DEO Verified TS Teachers Transfers Online Application form 2018 for Transfers Counselling in Telangana: Vacancy list uploaded by DEOs and Provisional Eligibility list with entitlement points and Preferential Categories is available now on Teacher Transfer Portal. You may also download your Transfer Application as verified by the DEO. If you have any issues, please contact District Educational Officer. - CDSE,TS. Application Link: Verified "Teachers Transfers Application"
Step 2: Please select "SERVICE" in the Menu Bar then select "Teachers Transfer"
Step 5: Then application form will open for entry by you. Step 6: After filling your application form, and click on "Preview" to check the entries made by you and make any corrections as required. Step 7: After satisfying your self all entries made by you click on "submit" button to complete the process for applying teachers form. 4. Mere submission of transfer application form doesn’t conform right for transfer of the applicant. Step 1. ముందుగా HTTP://TRANSFERS.CDSE.TELANGANA.GOV.IN వెబ్‌సైట్‌ని ఓపెన్ చేయాలి. Step 2. అనంతరం వెబ్‌సైట్‌లో లాగిన్ అవ్వాలి. Step 3. తర్వాత మెనుబార్‌లో ఉండే SERVICE అనే కేటగిరీని క్లిక్ చేయాలి. Step 4. తర్వాత TEACHERS TRANSFER ను సెలెక్ట్ చేసుకోవాలి. Step 6. ఆధార్ నెంబర్ ఇచ్చి SUBMIT బటన్‌ను క్లిక్ చేయాలి. Step 7. వెంటనే మీరు ఎంటర్ చేసిన మొబైల్ నెంబర్‌కు ఓటీపీ వస్తుంది. దాన్ని వెరిఫై చేయాలి. Step 8. అప్పుడు అప్లికేషన్ ఫాం మీకు ఓపెన్ అవుతుంది. Step 9. ఫాం నింపిన తర్వాత ప్రివ్యూ ఆప్షన్‌ను క్లిక్ చేయాలి. Step 10. ఒకసారి అన్ని డిటేయిల్స్ సరిగా ఉన్నాయో లేదో చెక్ చేసుకొని, ఏవైనా కరెక్షన్స్ ఉంటే ప్రివ్యూలో చేసుకోవాలి. Step 11. తర్వాత SUBMIT బటన్‌ను క్లిక్ చేయాలి. Step 12. దీంతో అప్లికేషన్ ఫాం నింపే ప్రాసెస్ పూర్తవుతుంది. Step 13. ఆన్‌లైన్ దరఖాస్తు ముద్రిత ప్రతిని ఎంఈవోకు సమర్పించాలి. *HM's /Teachers may submit their preferences(Web options Entry) of schools on http://cdse.telangana.gov.in. Step 3: Fill in the application form as per the instructions given in the User Guide and Government Orders and also keeping in mind the clarifications issued from time to time. Step 6: The application will be opened. ii) If the datais not correct or does not relate to the candidate, press 'BACK' button. vii) Select the calendar Date since when he/she is working in the present school. The system will calculate the period as per the norms given in the Watnment Orders. viii) Select the Categkr of the present school (1/11/111/IV). In case of change, a provision is given for changing the category of the school in last 8 years. Step 9: If HM/Teacher wants to avail Spouse points then give details like Treasury Id, Name, Designation, Working office, District, Mandal, of the spouse. e. On submission of applickWi form online the candidate shall be given reference ID number which should be kept carefully for any kind of ce. Submission of application can be considered eted only on receiving reference ID number. f. submission, the candidates shall take a printout of the application, along with the certificates and store it for future use. a. HM/Teacher claiming the points mentioned below, need to upload the certificatesas indicated in Government orders. f. Sports participation certificate counter signed by Chairperson, SMC committee. b. After submission of -onvine application, if any corrections are noticed by HM/Teachers request has to be raised at DEO office for any correction. Final seniority list will be generated after completing the above process and as confirmed by the District Educational Officers concerned.